Tough Cookie breaks out onto the ledges and heads for the Kearsarge North tower. Near the top of Kearsarge North, we begin to see and feel signs that we are not going to escape winter before we finish the list. A full on storm was raging north of notches as we drove down. Here, further south, the sky is blue, but hints of hail and ice mark the trail. We pause before the exposed ledges, our breath short and visible. I’m feeling chilled and somewhere above us a cold wind roars over the summit and we can hear trees groan under its force. Janelle immediately drops her pack and starts rummaging around for her gear. No protest. Any questions will come later. We’re fully a team now. In the last few weeks, as we’ve inched closer and closer to the finish line, I’ve been humbled by her trust. I watch her gear up not because I told her to do it, but because she understands now what she must do to stay safe and warm. “Can we have some tea before we go up there?” she asks. So I break out the thermos and my partner and I sip raspberry tea, pull our hats down over our brows and listen to the wind scream. Full on winter conditions. This will be our first foray into cold like that. Janelle smiles and hits the ledges at nearly a run. Above, the frigid wind waits. Location: North Conway. I-93 north to Exit 23 to Route 104 east to Route 25 east to Route 16 north to Hurricane Mountain Road, trailhead on the left. Our trailhead: Mt. Kearsarge North Trail, up and back. Author note: We’re counting down to our final four vignettes! Number 48, The Horn, will drop on Tuesday, Dec. 4. 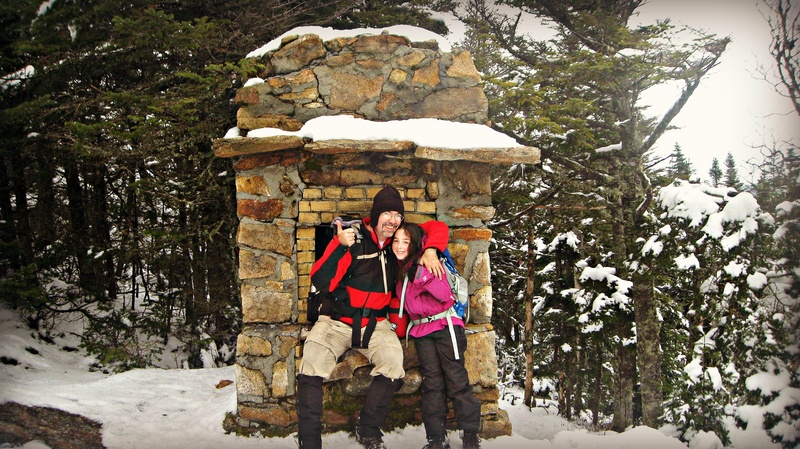 Stop by as Janelle and I face our first full winter conditions hike. But first, on Sunday morning, Dec. 2, we’ll have a little website / Facebook page contest! Look for that announcement on Sunday morning. One of the “easier” blowdown sections on the Old Paugus Trail. There is no getting around the blowdowns. Four hours into what is supposed to be a three-peak circuit in the Sandwich Wilderness, Janelle and I are faced with a seemingly impossible-to-solve puzzle. We are too far into the hike to turn around, especially since going back would require a steep decent in choppy conditions off the south end of Paugus cliff. But ahead of us the trail is destroyed. Hurricane Sandy had swirled through two days earlier and the Old Paugus Trail is, in this section, gone; as though the hand of a giant had swished across the range, brushing over four and five-inch thick trees like toothpicks. I cannot not see the continuation of the trail on the other side of the enormous, perhaps valley-wide, blowdown. “What do we do?” Janelle asks. I sense her frustration, and feel my own. It has already been a tiring hike. The day is raw and windy. Three summits is now out of the question, which puts our pre-Thanksgiving finish in danger. But even more disturbing is the problem immediately facing us in the form of what appears to be the obliteration of the trail. I slip off my pack and gulp down some water. Then, I push on the cluster of fallen trees in front of us, checking for give. There is none, which is good. It means the blowdown directly in front at least is fully down and won’t collapse on us. The slope to our right is too steep to go down and back around and the up-slope to our left is too dangerous to attempt. So, the girl and I slowly begin snapping off branches on the trees in our path, trying to create a window among the trunks. That’s grueling work. After a while we have enough of an opening to slip through. We zig and zag in and out and under the trees, snapping branches in some places, crawling on our hands and knees in others, until an opening appears ahead. After 30 minutes of work we step through onto the path and come face to face with another, bigger, section of blowdown. And beyond that, more. 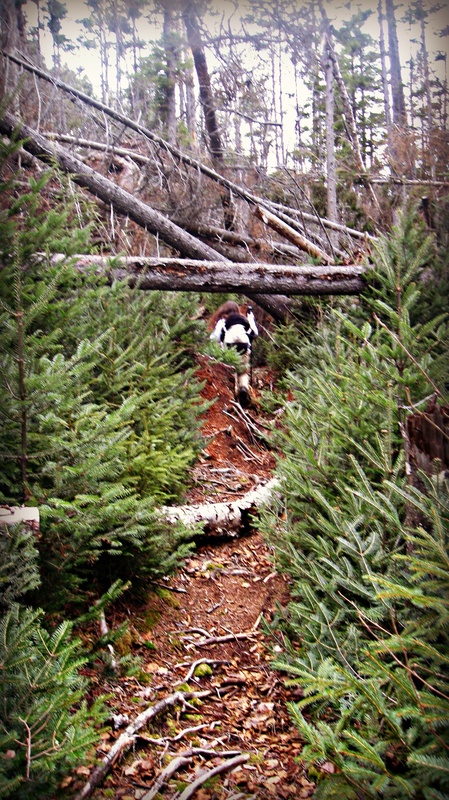 “Well, at least if anybody hikes this after us, they’ll have an easier time,” Janelle says. Location: Sandwich. I-93 north to Exit 24 to Route 3 east to Route 113 east to Route 113A north to trailhead on left. 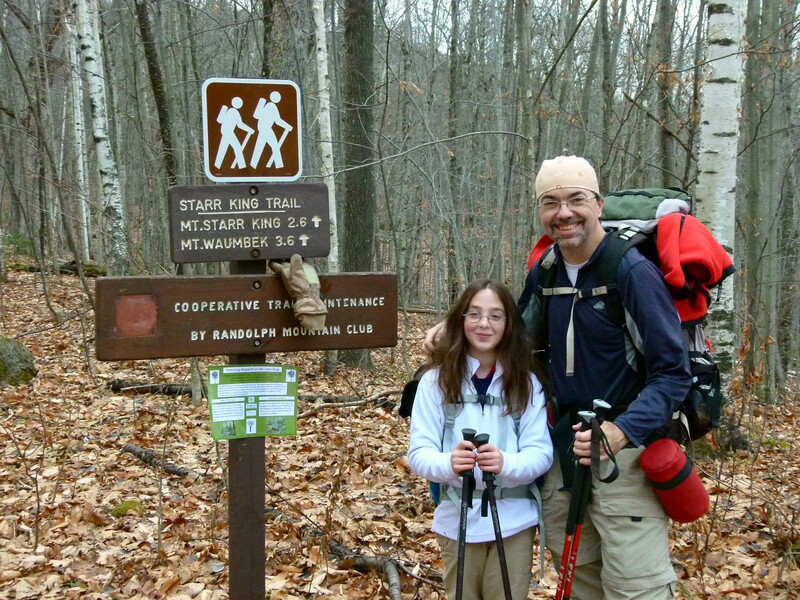 Our trailhead: Big Rock Cave Trail to Old Paugus Trail to Lawrence Trail to Cabin Trail, loop. Buffalo and Tough Cookie are back! Ready for us? Let’s go! A couple of bigger turkeys! How’s that for thinking alike? Even though Buffalo and Tough Cookie (along with Captain Chaos and Short Step) were separated by a few hundred miles and a couple states over the holiday, they still had turkey on their minds. With the holiday behind us, we’re eager to resume our path to the release of the book. (Well, Tough Cookie is equally eager about Christmas, of course.) Starting tomorrow, we’ll begin the final six vignettes of our last two weekends of hiking. We’ll have more exciting events to announce and there’s still lots of pictures to sort through. And of course just because the 52’er list is finished doesn’t mean Buffalo and Tough Cookie won’t continue with some new adventures. After all, winter in New England means snowshoeing, snow hiking, ice lake trekking and cold weather runs. We have a hike up to Lonesome Lake Hut on tap and there will certainly be lots of sledding as well. In the meantime, we will begin a new effort to raise awareness about the book, website and our Facebook page. And that begins with all of you passing the word, along with some great press that just dropped on Wednesday. Keith Testa from the Concord Insider attended our presentation at the Woman’s Club of Concord and this great article ran in last Wednesday’s paper. Thanks for the kind words Keith! Onward friends! We’ve only begin this great adventure! Happy Thanksgiving, we’ll see you after the holiday! We have much to be thankful for! Have a wonderful holiday and we’ll see you soon. Thank you Trish Herr for this pic. Ever onward! 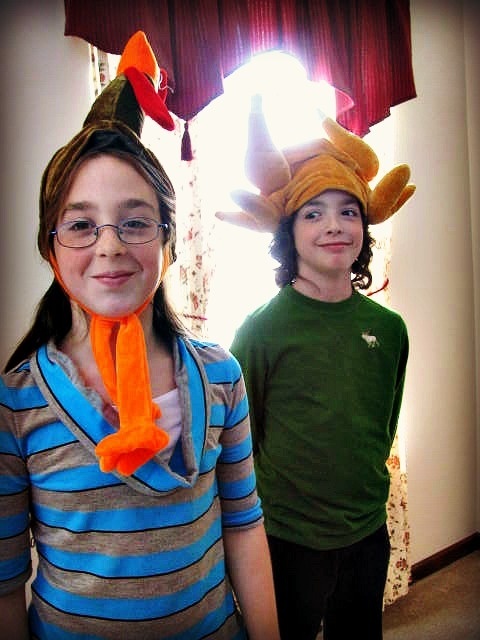 It pretty much goes without saying that Janelle and I have quite a bit to be thankful for! Each other of course. But also our families. In the next week, we’ll both be able to spend some quality time with those who have loved and supported us the most through this journey. Though we’ll miss each other, we’re looking forward to relaxing, visiting and catching up on life. 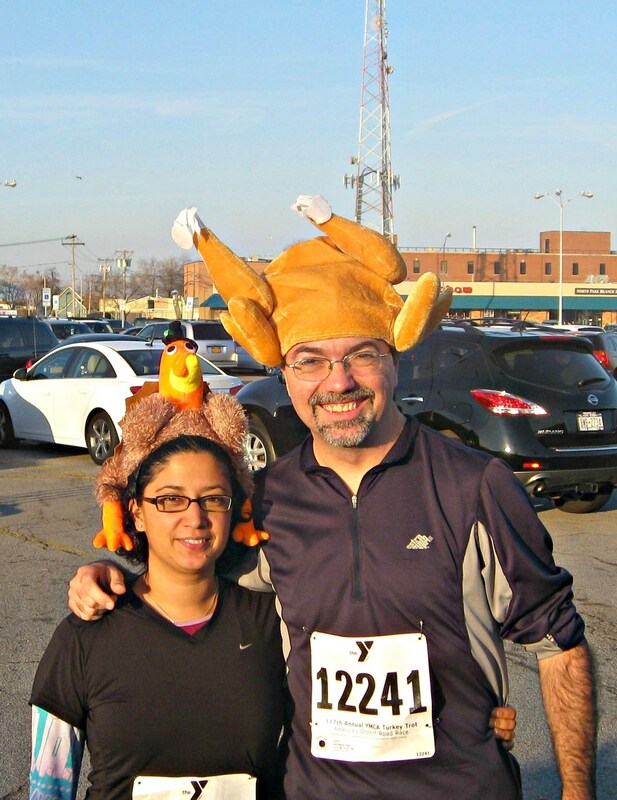 So, being thankful… first, we are forever thankful for the love and support of Meena and Aaron, our two greatest supporters and fans. Also, our families have been pretty outstanding, coming together to cheer us on, leave comments, boost us up when we were down and celebrate every victory. Then, there’s been the amazing hiker community, many of whom have hiked with us, given us crucial trail info, let us use pictures and have been enthusiastic right from the start. We are pretty fortunate. What better time to have finished our hiking than right before Thanksgiving? Well, that chapter is behind us now, but what lies ahead will be as amazing and incredible! When we return, we’ll finish off the final six vignettes of our hikes. We’ll begin lining up events and presentations so we can meet you all. The promotional material and swag (including stickers and posters) for the book will begin to take shape. 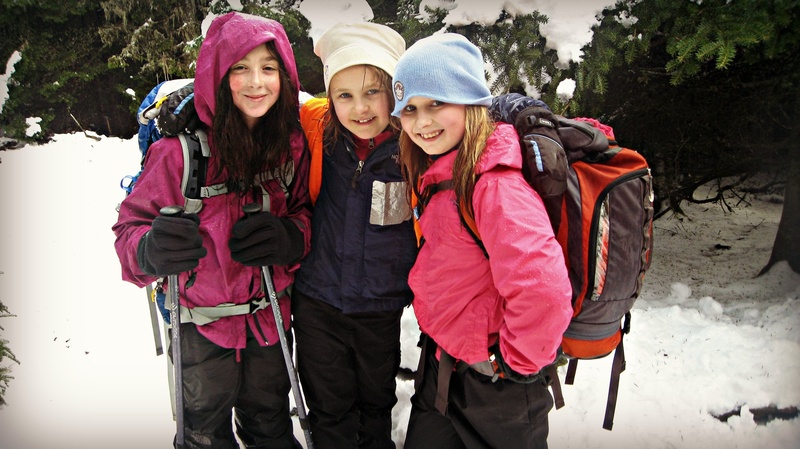 And somewhere in there, the girl wants to learn how to snowshoe. And she wants to hike over a frozen lake. Lonesome Lake anyone? The adventure continues. We march on. Stay with us! The best is yet to come! We did it! A joyful finale to a memorable journey! Epic adventures are about the people you meet. We were fortunate and honored to become friends with Sage and Alex Herr, two amazing young ladies with joyful souls. The three became fast friends. Along with their mom, Trish, and our good friend, Steve, they accompanied us on our final hike up Mt. Starr King. We did it! Janelle and I climbed them. The 52 WAV are complete! On Sunday, Nov. 11, at 10:45 a.m. Janelle stepped up onto Mt. Starr King and completed an amazing quest that began one year and six days ago when we first set off on this journey of discovery across New Hampshire. We laughed. Alot. And we cried a little too. Mostly, we learned about each other and about ourselves. We are better friends. And now, we’re taking our story to you. Honestly, we have no idea what the heck we’re going to say. But tomorrow, as we gather at the Woman’s Club of Concord and munch on trail mix and PB&Js with the kind ladies who invited us, we begin a new chapter in our amazing adventure. Stop by. We’d love to meet you and hear about your own adventures. We’ll be there from 5:30 to 7 p.m. (Chamberlin House, 44 Pleasant St., Concord NH 03301). I’ll have more pics and a slide show in the next few days. And perhaps I’ll have a little excerpt about our final hike. But for tonight, as I thought about this great weekend, I wanted to find the picture that best summed up this past year. I can find no better image than the above shot of Janelle, Sage and Alex. Keep hiking your own hike my friends. Today we rest, tomorrow we begin a new adventure. Stay tuned, the best is certainly yet to come! Buffalo and Tough Cookie celebrate number 52 at the old fireplace atop Mt. Starr King. What a fine journey!